I spent the night sleeping in the small allotment of bed Chena, who had defected from Traveler Thirteen for the night, afforded me. I'd forgotten how much dogs could be bed hogs. At least she didn't steal the covers. Upon awaking and finding Chena on my bed rather than hers, Traveler Thirteen said, "Chena, you whore, you spent the night with someone else!" I nearly fell out of bed laughing. We quickly exited Motel 6 and made for Al's Trailer Sales in Farmington, where we left the trailer to be repaired. The guy helping us turned out to have climbed fifty-four 14,000 footers in Colorado. We then found a diner and had a big American breakfast. Oh, how I love pancakes! Farmington seems to be a center for the oil industry. That and there are halfway decent eggs and pancakes to be had is all I can say about the Farmington. 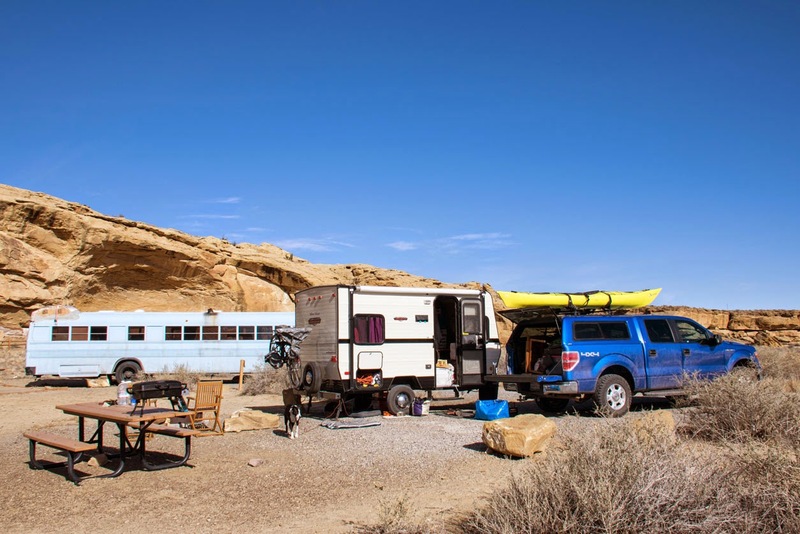 We didn't stick around to find out anything more because we wanted to get back to Chaco Canyon. By mid-morning the trailer was repaired. 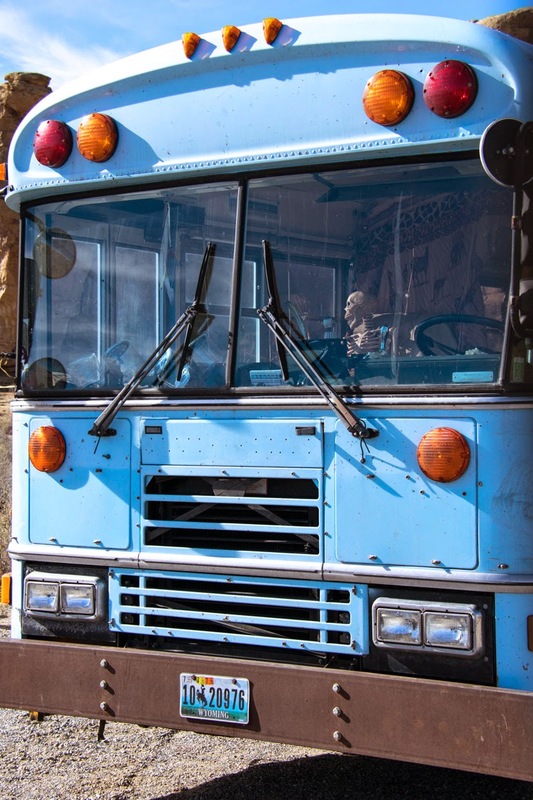 I drove this first leg. I've never taken a truck and trailer through a gas station before. I've now done that. I didn't hit anything. I call that a success. I drove us out back southeast on Route 550 to Route 7900. Traveler Thirteen took over when we hit the washboard dirt track of Route 7950. 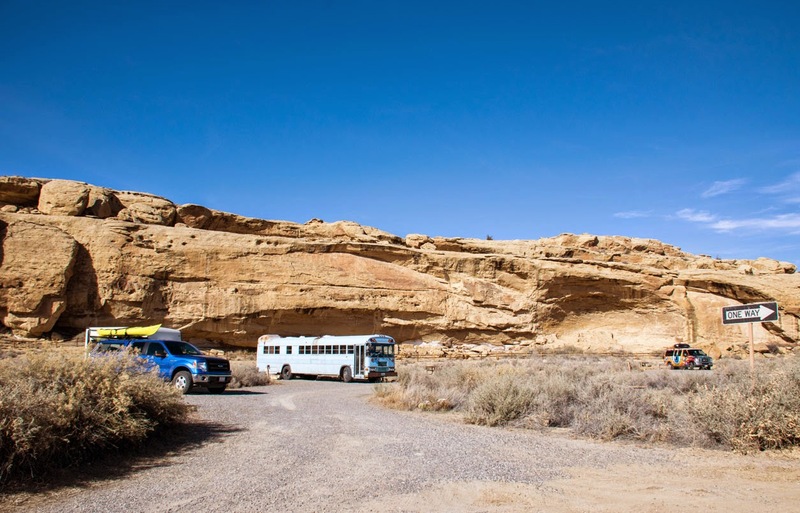 How different the approach to Chaco Canyon looked under this mid-day not-a-cloud-in-the-bluer-than-blue sky. It didn't look like the same place we had driven through during the dramatic dusk we experienced the evening before. 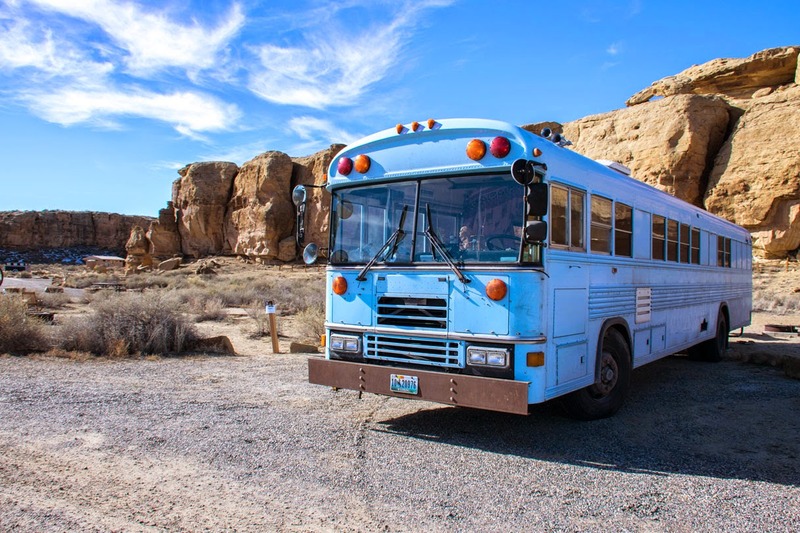 We drove into the campground to find we now had neighbors: a big blue school bus that had a skeleton as a co-pilot and a campervan with an eyeball painted on its sign. Thirteen's bright blue truck fit in quite nicely. Our campsite on the left and our new neighbors. As I walked by I noticed that the co-pilot had an unusual look. Too much time on the road perhaps? Camper Van. You can rent these. I heated up the leftover pizza on the camp stove while Thirteen got the dogs and the camper situated. Tootsie took up her usual post under the trailer while Chena kept an eye on us just to make sure we were behaving ourselves. 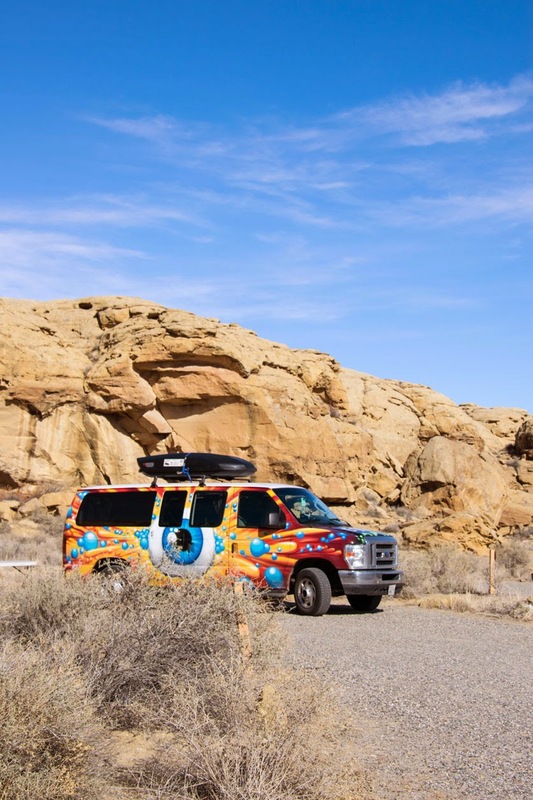 Now fortified we headed out to explore Chaco Canyon. 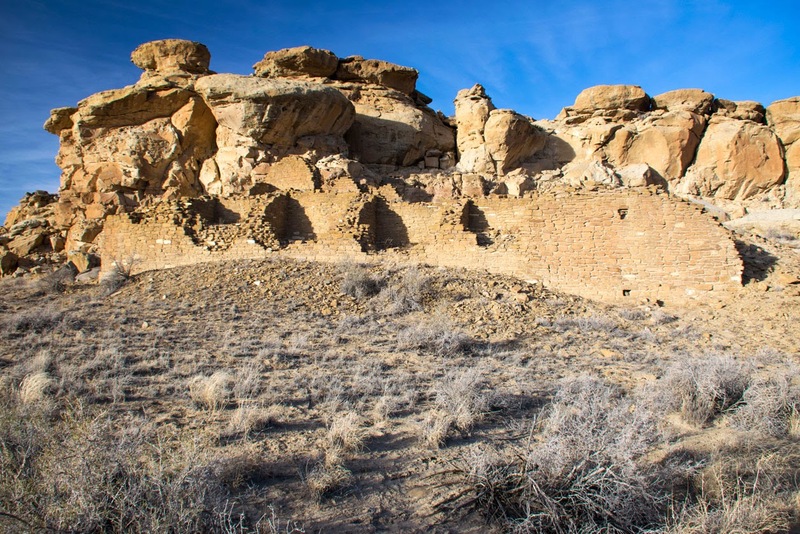 Chaco Canyon is a shallow 10-mile canyon that was once part of ancient sea beds. 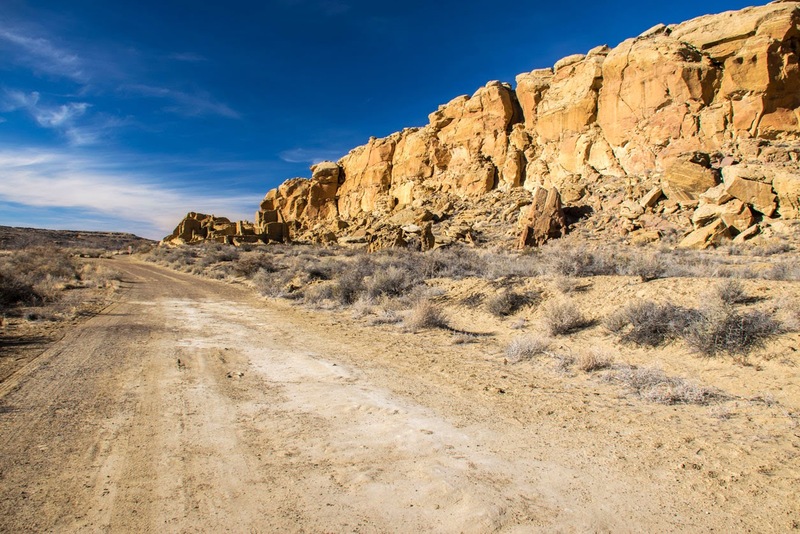 Centuries of erosion have created this high desert canyon. 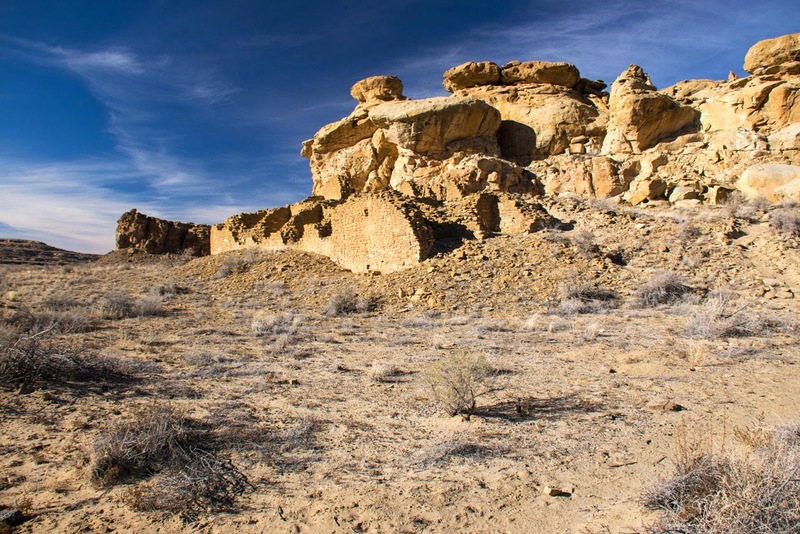 It is unbearably hot in summer and incredibly cold in winter, yet evidence of human presence here stretches back to almost 5000 years. 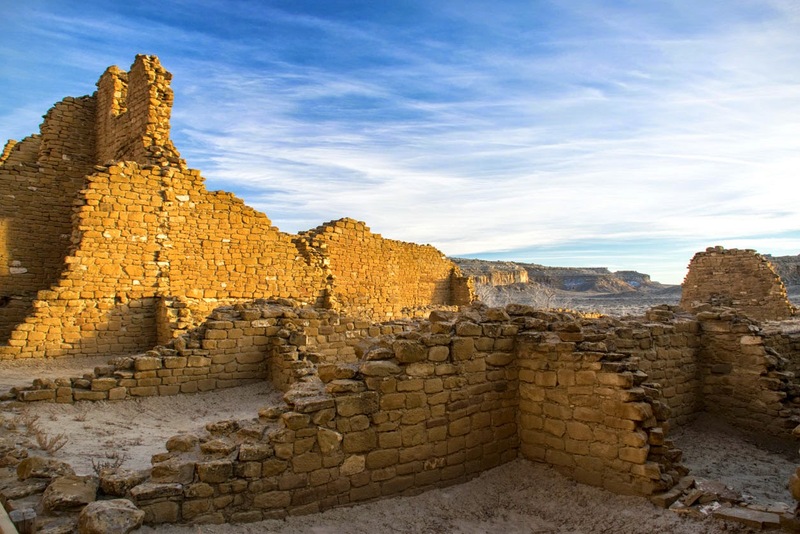 It was between 850 and 1150 that the Chacoan culture flourished here. 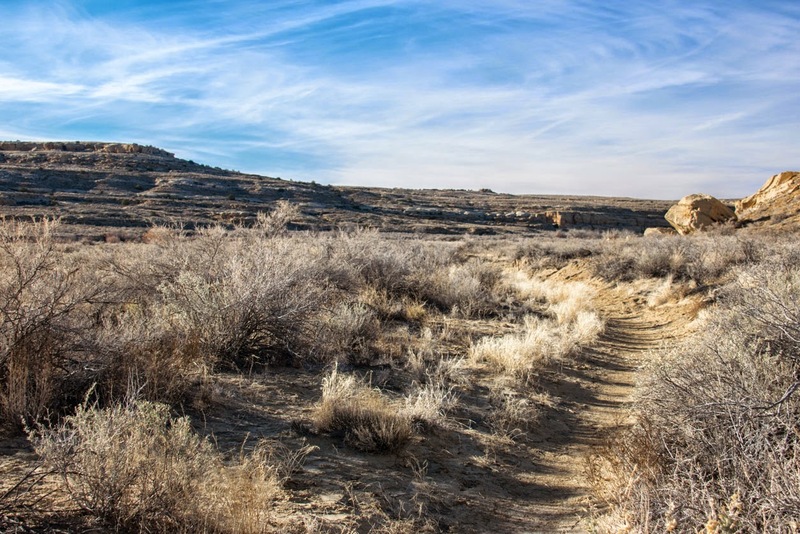 This was a major center of the ancestral Puebloan peoples. Here, as you walk through the remnants of the monumental Great Houses (massive masonry buildings consisting of many floors and hundreds of rooms), you get hints of just how amazing, complex and sophisticated these people were. These buildings were constructed oriented to astronomical markers and cardinal directions. 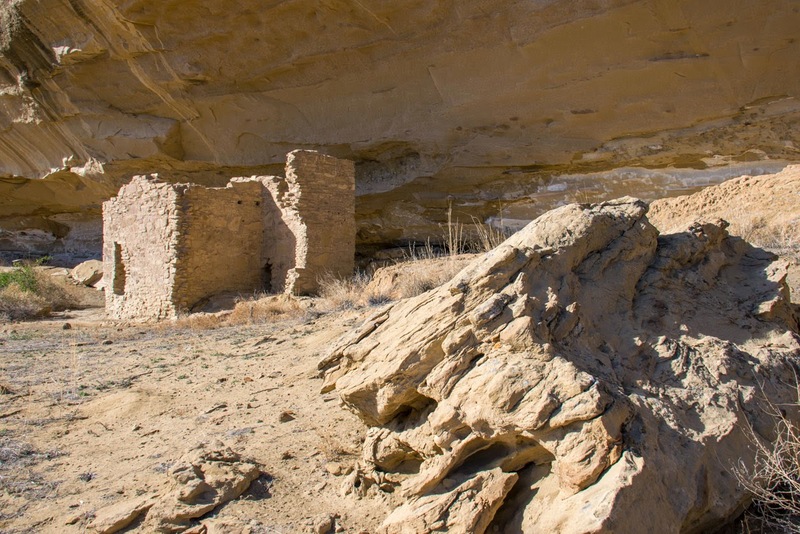 The dozens of Great Houses in the canyon were linked by roads to more than 150 other great houses in the region. 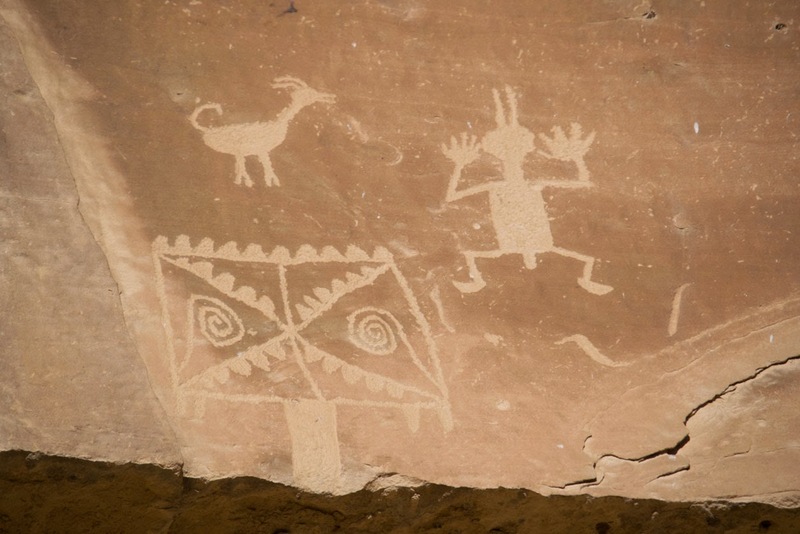 There is evidence of extensive trade and commerce routes reaching throughout the American Southwest and Mexico. 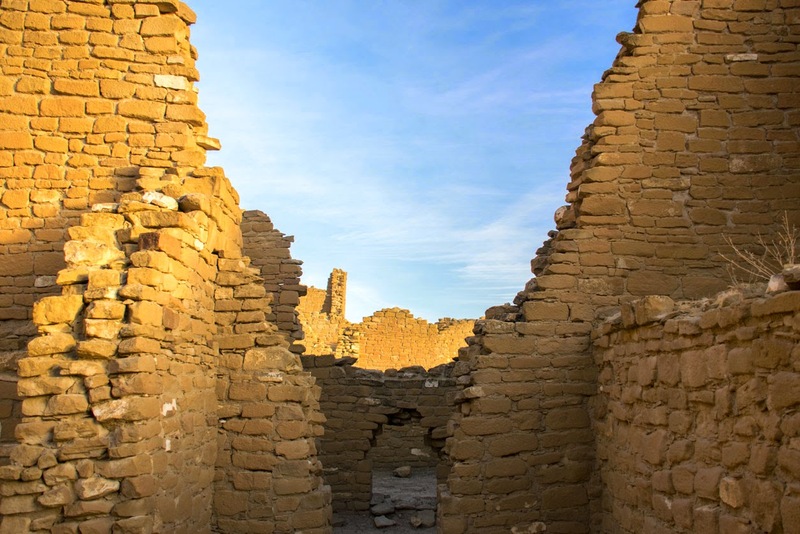 The area is still held sacred by the Chacoans' descendants. And it is remains an enigma in many ways for researchers. It is not thought that these were farming villages being lived in by large populations. Theorie tend toward it being the center of a huge trading network. 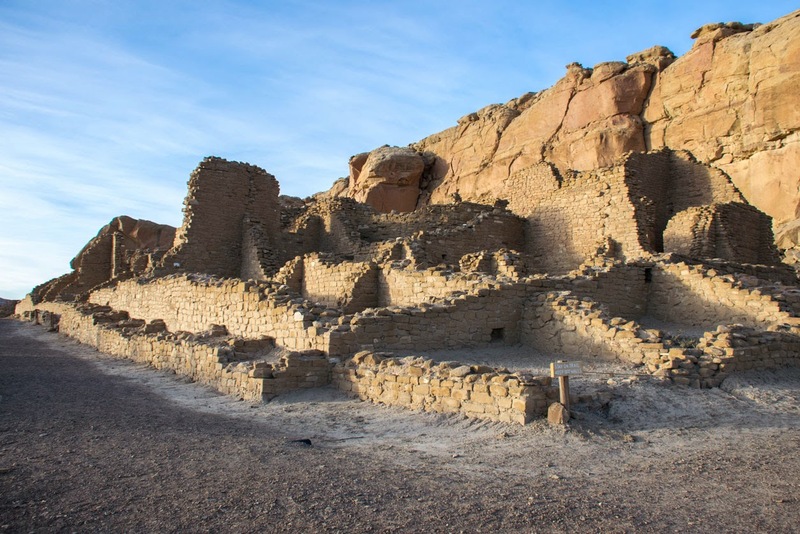 Pueblo descendants say that Chaco was the gathering place for many peoples and clans where traditions, ceremonies, and knowledge were exchanged. 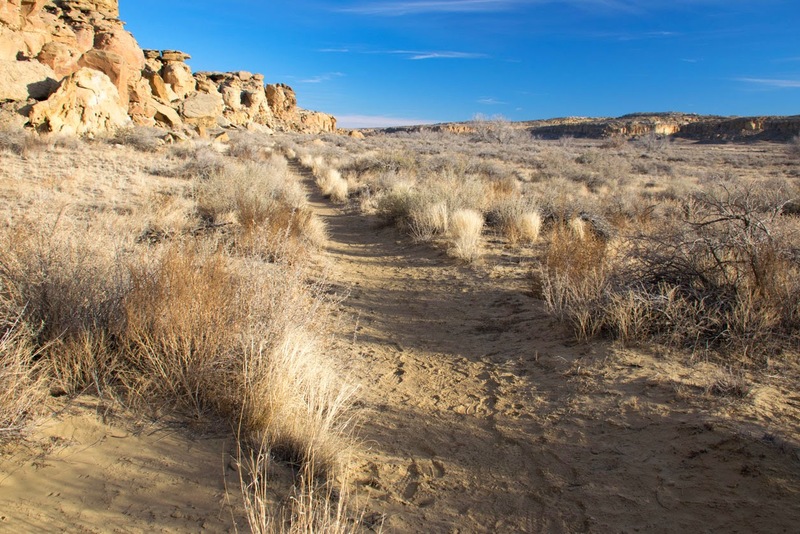 To me Chaco is a beautiful mystery and a powerful memory of an amazing people I wish I could know more about. There are so many old stories swirling around these ruins but they are indecipherable to me. A girl and her dog. Traveler Thirteen and Chena. Heading down the Penasco Blanco trail. 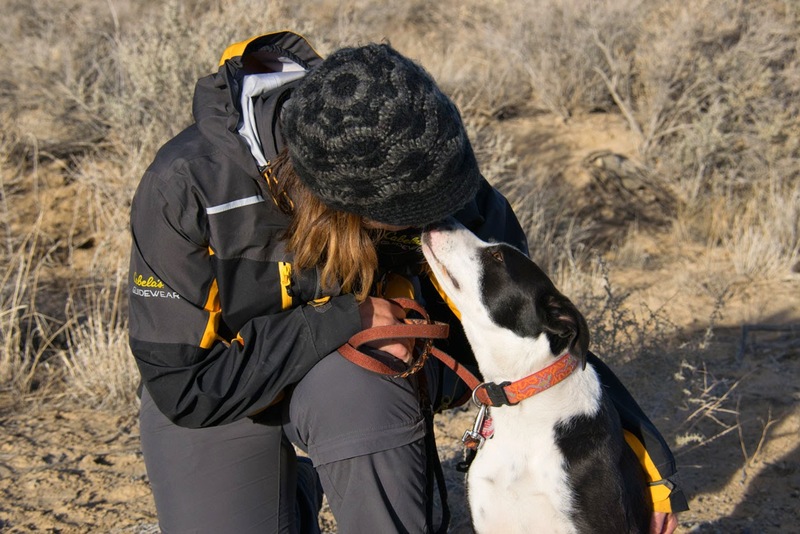 We headed out with Chena, going toward the Wajiji trail. There were elk tracks and elk poop all over the place. They were fairly fresh. 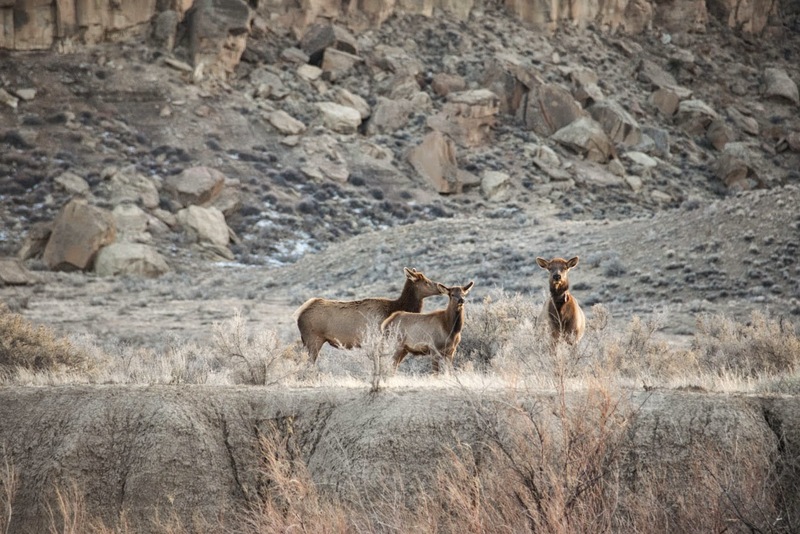 But the elk who left them weren't in evidence. We then changed our minds, given our now limited time here, and headed over toward Pueblo del Arroyo, one of the Great Houses. We parked there and hiked out the trail that leads to Penasco Blanco, another Great House. 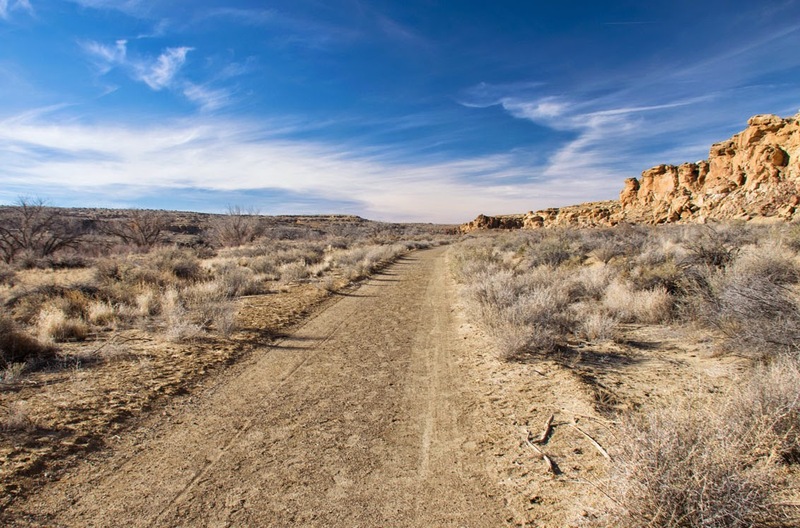 We walked out through the dusty, sandy trail in the golden afternoon sunlight. 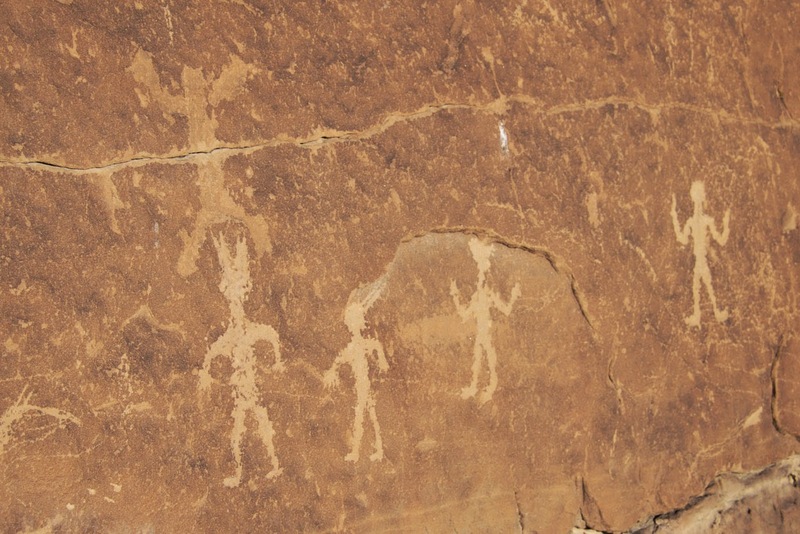 We explored a quarter mile loop along the canyon side looking at petroglyphs. 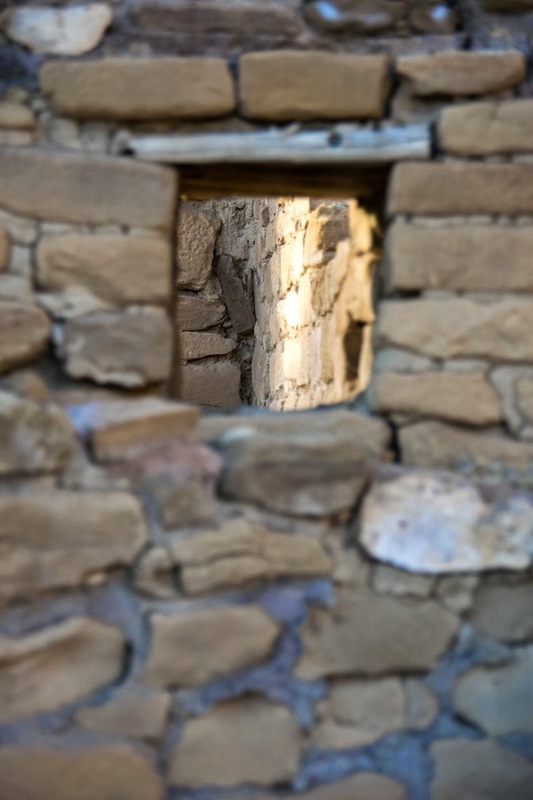 Then we wandered through the ruins of Casa Chiquita and Kin Kletso. I couldn't help wondering what these Great House must have been like when inhabited. What was it like to wander through these buildings. What did they smell like? What did the food taste like? How did it sound 1000 years ago as the voices of many people echoed through the valley? The sides of the canyon. 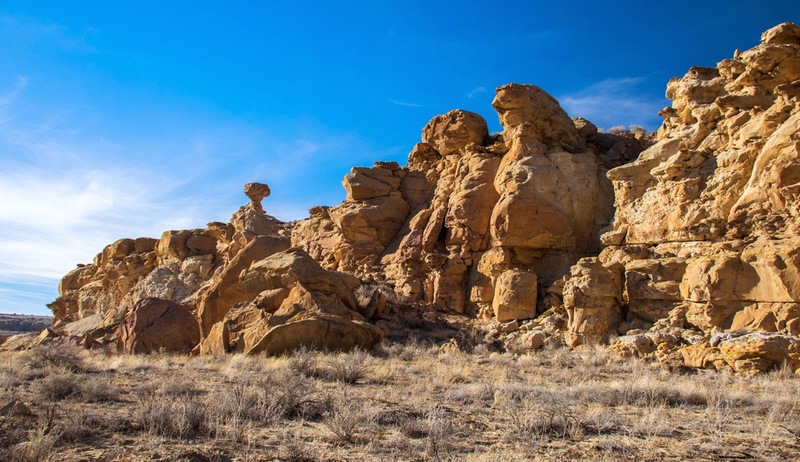 The more I looked at these rock formations the more interesting figures I saw in them. It was like finding shapes in clouds. The unexcavated Casa Chiquita. Chacoan Great House occupied from 1100 to ~1150. 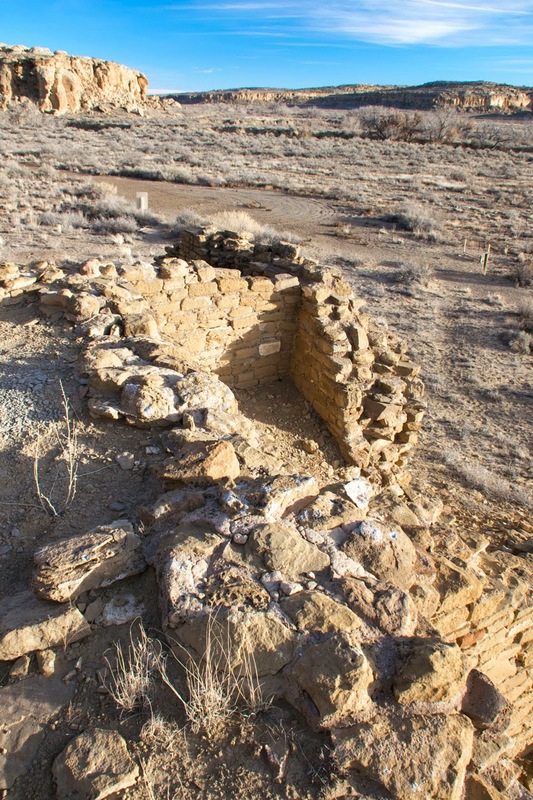 The low profile of the ruins of the Penasco Blanco Great House can be seen up on the mesa, center of photograph. 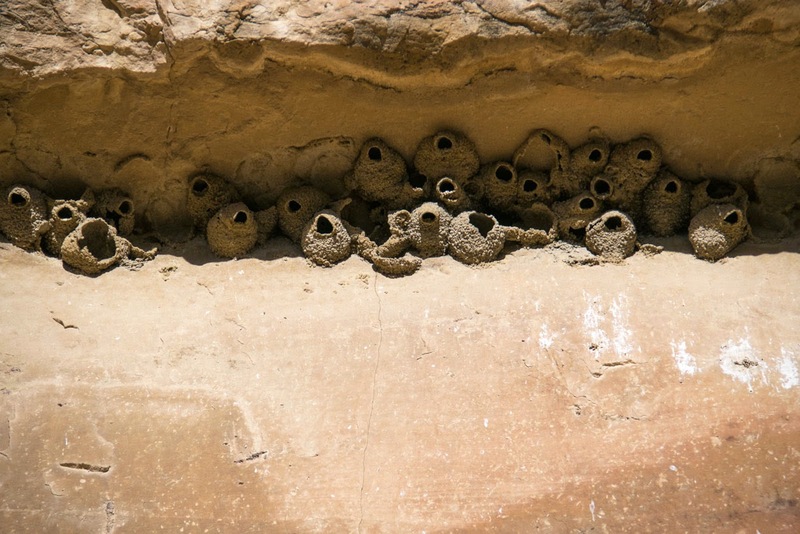 Cliff swallow nests on the canyon wall. They are painstakingly made of mud. Heading back toward Casa Chiquita. Casa Chiquita. A better look at the masonry work. Kin Kletso Great House. Kin Kletso is Navajo for Yellow House. Occupied between 1100 and ~1150. 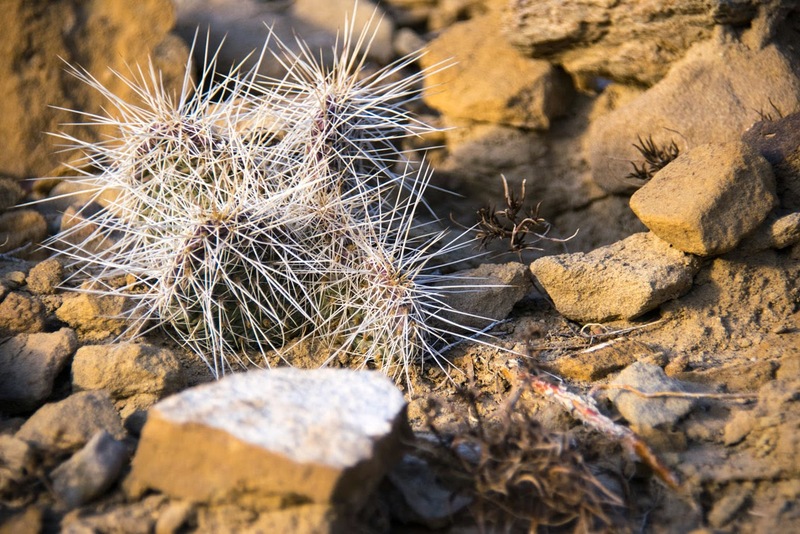 Cactus growing on Kin Kletso. 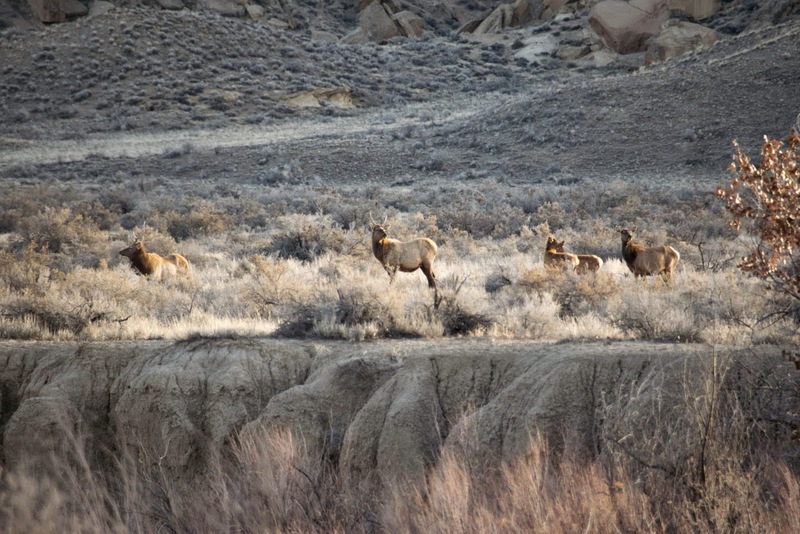 As we walked back we saw a herd of elk on the opposite side of Chaco Wash. There were several mothers with babies. I watched as one baby very violently head butted its mother as it nursed. 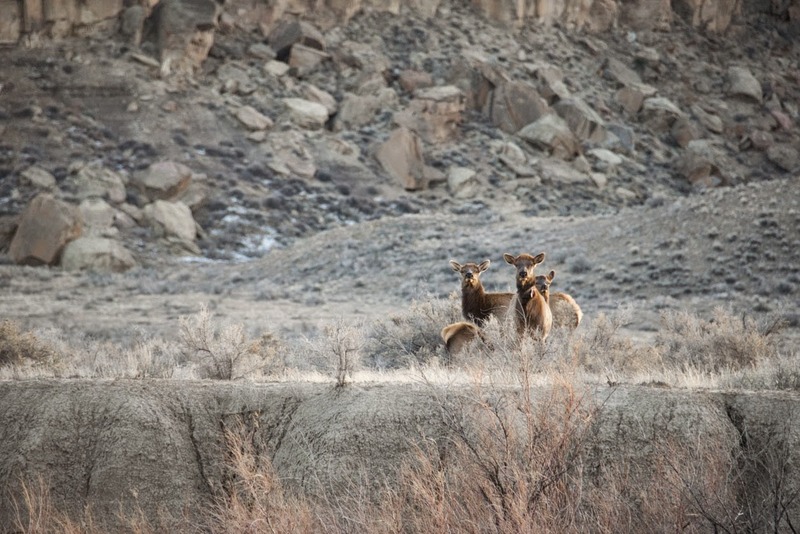 Elk along side the edge of Chaco Wash.
Back at the campsite, Thirteen and made a dinner of pork chops, chopped vegetables, and rice that we cooked over open fire and on the camp stove. We also experimented by trying to cook cinnamon rolls in orange halves over the fire with varying results. Add chocolate. It helps. 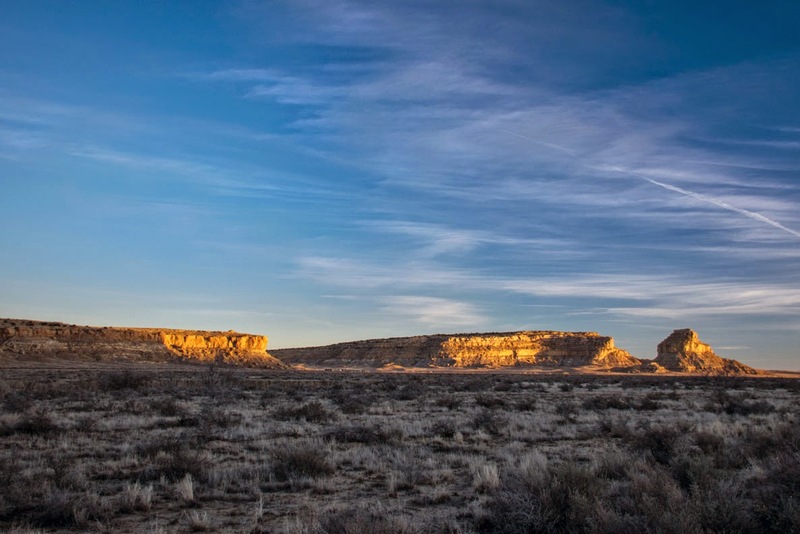 Fajada Butte on the right. Also a sacred site. 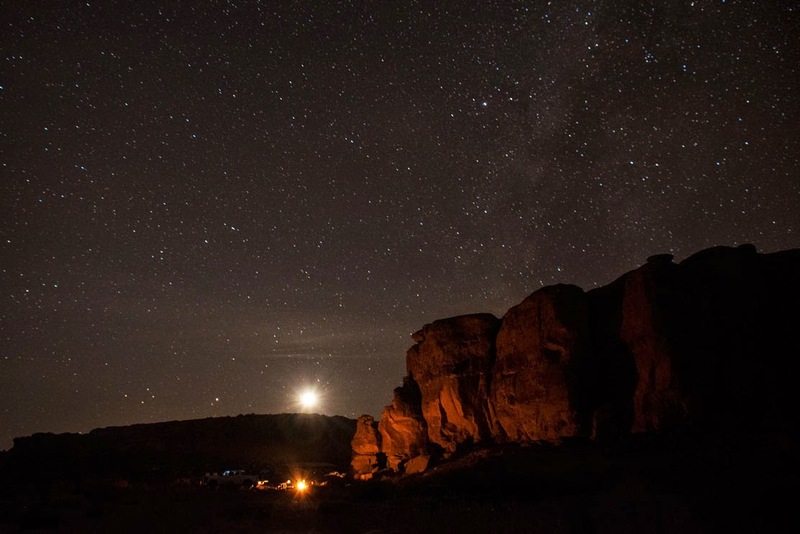 Chaco Canyon is also a designated dark sky park. 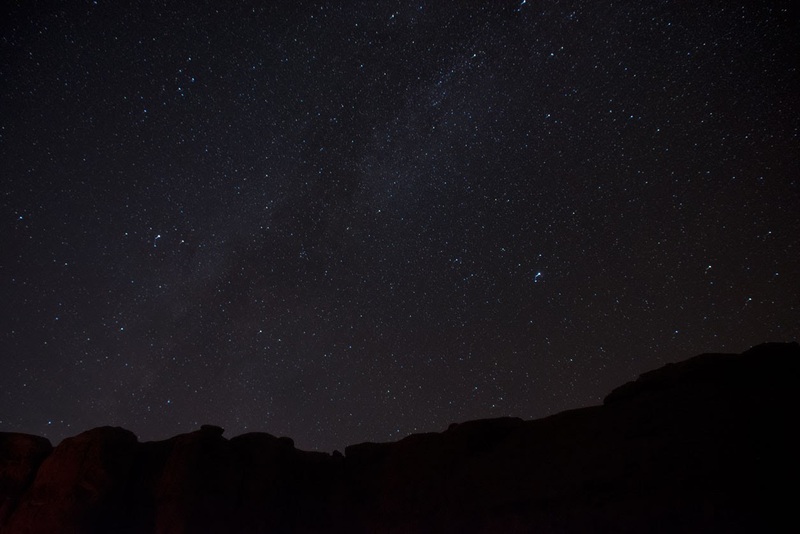 That means, because its 70 miles from the nearest town, there is no light pollution. It is an amazing place for star gazers and night photographers. As we waited for the cinnamon rolls to cook, Thirteen and I got out our cameras and tripods and experimented with night time photography. This was fun but frustrating too. But as with any new photography technique, practice makes perfect. I think this will be something I explore further in the future. Night photography is like a whole other universe where you can see into the universe. It's a technique I want to conquer. My first attempt ever to capture a photo showing the Milky Way. I need more practice. 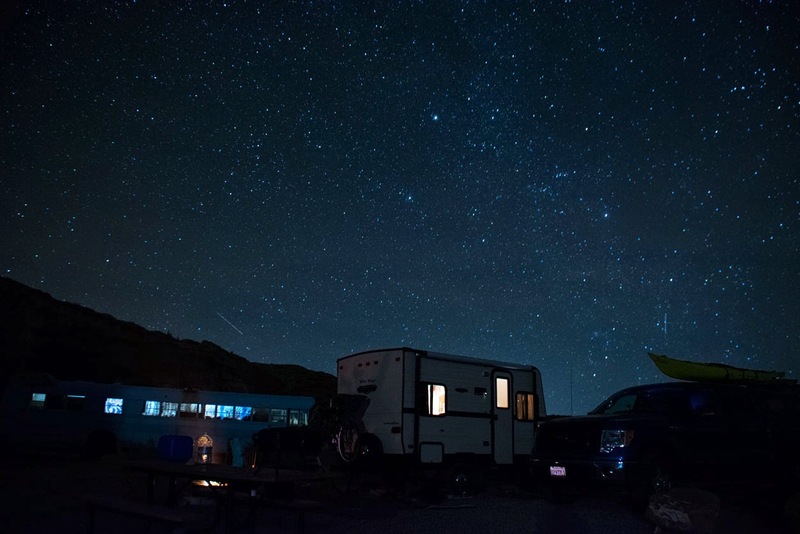 Our campsite and the stars. The moon about to disappear below the horizon and a campfire setting the cliffs aglow.